In collaboration with QuantAlea, Zurich, a Swiss software startup in GPU parallelization frameworks for .NET. Project duration: 2014 - 2016. Funded by Swiss Commission of Technology and Innovation (CTI/KTI). This joint research project aims to develop a new programming model and runtime system for the .NET framework to radically simplify GPU parallelization. Programmers should eventually profit from the massive parallel power of today's GPUs without having to deal with low-level GPU-specific aspects. At the current stage of the project, we have designed and implemented a dataflow programming model as an API atop .NET. The runtime systems maps the dataflow model to efficient GPU-parallel code by using techniques such as dataflow schedulers, cross-compilation from .NET CIL to CUDA, and automatic memory management with minimum copying between CPU and GPUs. The existing Alea cuBase infrastructure of the industrial partner QuantAlea serves as underlying engine and is further extended for this project. View our recorded talk "Radically Simplified GPU Parallelization: The Alea Dataflow Programming Model" from the GTC 2015 to get an overview of the new programming model and runtime system. The talk was given on March 20, 2015 in San Jose (CA), USA. P. Kramer, D. Egloff, and L. Bläser. The Alea Reactive Dataflow System for GPU Parallelization. HLGPU 2016 Workshop, Hipeac 2016, Prague, Czech Republic, 2016. Document. L. Bläser, D. Egloff. 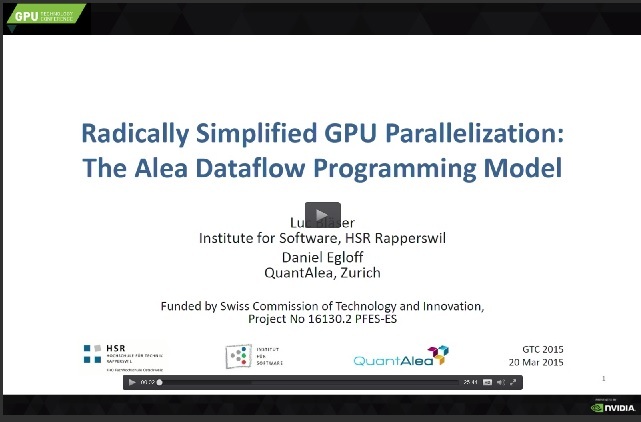 Radically Simplified GPU Parallelization: The Alea Dataflow Programming Model. Talk at GTC 2015, GPU Technology Conference, San Jose, CA, USA, Mar. 2015. Presentation. L. Bläser, D. Egloff, O. Knobel, P. Kramer et al. Alea Reactive Dataflow: GPU Parallelization Made Simple. Workshop on Reactive and Event-based Languages & Systems (REBLS'14) at SPLASH 2014, Portland, OR, USA, Oct. 2014. Paper.